The University of Colorado at Boulder's National Snow and Ice Data Center said Arctic sea ice on Sept. 16 stood at 1.59 million square miles, about 1 million square miles less than the long-term minimum average from 1979 to 2000. Scientists compared the loss to an area about the size of Alaska and Texas combined. The sea ice is at its lowest level since satellite record-keeping began nearly 30 years ago. 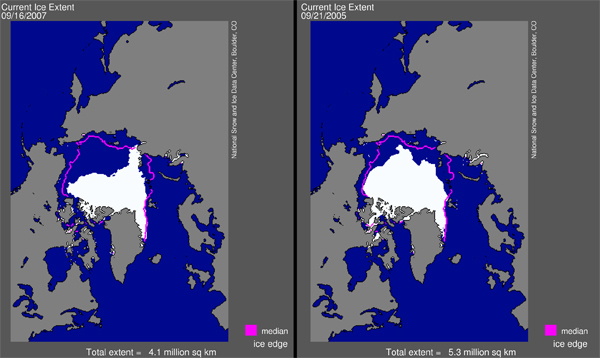 The Artic Sea ice extent now stands at 4.18 million square kilometers (1.61 million square miles). This represents an increase of 50,000 square kilometers (19,000 square miles) compared to the value of 4.13 million square kilometers (1.59 million square miles) five-day running mean extent, observed on September 16, which appears to be the 2007 minimum. Satellite data provide the best means of observing sea ice coverage and variability. A variety of remote sensing instruments have been used successfully to map sea ice conditions. Frequent cloud cover in the polar regions and the fact that the sun remains below the horizon for continuous periods in winter require microwave sensors to map ice cover. Passive microwave instruments such as ESMR, SMMR and SSM/I, and radar such as ERS-1, ERS-2, and RADARSAT provide the main data sets used for sea ice studies because of their nighttime and all-weather capabilities. Passive microwave data allow scientists to monitor the interannual variations and trends in sea ice cover. Observations of polar oceans derived from these instruments are essential for tracking the ice edge, estimating sea ice concentrations, and classifying sea ice types. In addition to the practical use of this information for shipping and transport, these data add to the meteorological knowledge base required for better understanding climate. Passive microwave imagery is available from late 1978 through the present. Earlier but less reliable data from the Electrically Scanning Microwave Radiometer (ESMR) are available from late 1972 to 1976. Global sea level is currently rising as a result of ocean thermal expansion and glacier melt, both caused by recent increases in global mean temperature. Antarctica and Greenland, the world's largest ice sheets, make up the vast majority of the Earth's ice. If these ice sheets melted entirely, sea level would rise by more than 70 meters. Such a change in the surface of the Arctic would have profound implications on climate, not just in the Arctic, but around the globe. Atmospheric and oceanic circulation will likely change, changing normal weather patterns. For example, some studies have indicated drier conditions in the American southwest if Arctic summers are sea ice-free. The southwest is already an arid climate and has been dealing with water resource limitations for several years, so such an impact could have profound implications. A group of photographers are documenting every hour of global warming. It is real folks.